It won’t be long after your baby starts walking that he or she is opening drawers, reaching up to shelves, grabbing things and getting into all kinds of mayhem. That’s why safeguarding your home for a growing toddler is so important — especially in the bathroom. Because of medications, cosmetics, appliances and reachable water access that tend to exist in the bathroom at home, it’s a place where your child is particularly vulnerable to danger. With that in mind, to help prevent injuries, protect your toddler and create better bathroom safety, here are a few tips for securing the bathroom. Always be near. Bathtub safety is a serious concern — so when the doorbell rings during bath time, either ignore it or scoop your toddler up in a towel to take with you to the door. Never leave your toddler alone during bath time, not even for a moment. Likewise, anytime your child is in the bathroom, it’s a good idea to be nearby. Keeping the door closed can prevent unsupervised access. Always empty the tub. As soon as a bath is over, empty the tub of water. Leaving standing water in the bathroom means leaving bathtub dangers where toddlers could topple into and drown, so keep it dry. Install anti-slip features to tub. 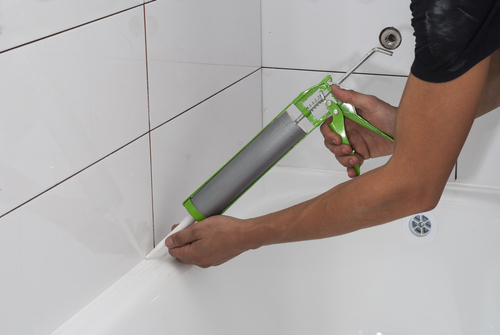 Whether it’s a rubber mat or non-skid decals, help prevent bathtub slips and falls by making the floor less slick. Lock the toilet. The same principle applies to the toilet, where even the small amount of water that sits in the bowl is a drowning hazard. Always close the lid when you’re not using the toilet, and install a child-safe lock that prevents toddler access. Lower the water temperature. Protect against potential scalds or burns by lowering your house’s water temperature to 120 degrees Fahrenheit. You could also get an anti-scald device for added protection if desired. Childproof knobs. There are childproof doorknobs, sink knobs and tub knobs on the market today, so it’s incredibly easy and convenient to pop them on your faucets and doorknobs to prevent kids from running water or gaining access when they shouldn’t. Keep hazardous materials high and locked. Your hairspray, mouthwash, makeup and even medications may not seem like hazardous materials at first glance. In the hands of a toddler, however, they become objects to taste, touch, open and explore. From cleaning products to everyday toiletries, keep hazardous materials high out of reach so that your kids can’t access them. Keep meds in childproof containers. Whether you’re talking about aspirin or prescription drugs, any medication you keep in the bathroom should be stored high and have a childproof lid. Always unplug. When you use blowdryers, curling irons, flat irons, electric razors or any other bathroom appliances, make sure you unplug them after using and store them out of the way. 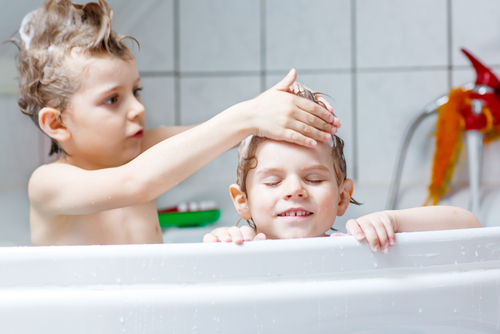 When it comes to modern bathroom safety for your child, you can’t be too careful — so to protect your little one from injury, follow the nine tips above. Learn more about the top-quality bathroom products at Modern Bathroom, your resource for the best prices on tubs, mirrors, accessories and more! Choose a theme. The best bathroom designs are cohesive. In other words, they stick to a specific theme throughout their colors, features and finishes. Before you start choosing new pieces for your bathroom, take time to think about your style. Do you want a country look? Something bright and modern? Explore different designs in magazines and online, and know what look you like. Save energy. Finding ways to practice sustainability in the bathroom is more than trendy; it’s also a great way to cut costs. While eco-friendly features like WaterSense faucets and vanities made of sustainable wood require an initial investment, they pay you back with savings over time. What’s more, they add to your home’s appeal when it comes time to sell. Brighten up. Natural light is great, but at night, or in bathrooms with small windows, you need alternate lighting options. Install sconces on either side of the mirror to add illumination to your morning routine. Likewise, pick a dramatic light fixture to brighten and add style to your bathroom space. Maximize storage. Another valuable bathroom feature is storage space. Look for ways to maximize it in your bathroom, by choosing a vanity instead of a pedestal sink if you have enough room for one, for example. Likewise, consider floating shelves for a way to add storage without taking floor space. Add baskets or totes to create places to keep items you need in the bathroom. Create a focal point. If you have the space to incorporate a freestanding tub, use it as a focal point for the bathroom. Tubs come in various styles, from classic claw-footed to more streamlined, sculpted options. What’s more, they add the kind of luxury feature that turns a bathroom into more of a retreat. Go crafty with cabinetry. You have so many options for a bathroom vanity, including single or double, modern or traditional, wood or other materials. Some people even repurpose vintage furniture to hold their sinks and plumbing. Explore the options to find a style that fits you and reinforces your theme. Find floors that last. The best bathroom floors are slip-resistant, long lasting and attractive. With that in mind, look into tile or stone that’s honed for more traction. Add your touch. Whether it’s the artwork you hang on the walls or the shower curtain that you pick, there are lots of ways to reflect your personality in your decorating. To make the bathroom your own, don’t be afraid to add your personal touch. When you want to create a modern bathroom that stays in style, use the eight bathroom tips above to get started! Be sure to shop our website to find the best deals on everything from vanities to mirrors. Modern Bathroom is proud to offer factory-direct deals that save you up to 70 percent of traditional costs, as well as free shipping straight to your home. Whether you’re trying to make your master bath feel more luxurious or your powder room feel less cramped, there are a lot of ways to expand the sense of space in a bathroom. From the colors you choose to the kind of lighting in the space, a variety of factors can influence the overall perception of comfort and spaciousness. Rethink the Door. A traditional door may seem like the obvious choice, but have you thought about the fact that it takes away square footage with its need to swing in and out of the room? Change the door so that it swings out into the hallway if possible, or consider replacing it altogether with a pocket door that tucks away into the wall. Paint Neutral. Brighter is better when it comes to the feel of a room’s size. While dark colors tend to shrink the feel of a room, bright colors open it up and make it feel airier. Go with light, soft neutrals throughout. Go Monochromatic. Even if your walls are all white, if your fixtures are black or the floor is green, you’re missing an opportunity. Make everything monochromatic to create one clear visual effect. Using a single, neutral color throughout the bathroom will make the most of its space. Think Small. When you want your bathroom to feel big, you have to think small — with your fixtures, that is. Instead of a full-sized vanity with a cabinet, opt for a pedestal sink. Instead of the largest light faucet, opt for one suited to the sink. Choosing items that are proportionate to your space will make a big difference in the overall look. Brighten Up. Windows can make a big difference regarding how a room feels, largely because of how they let in light. The same is true of unnatural light. You can apply this principle to your bathroom design by incorporating as much light as possible. Aim to have a light over the shower/tub, lights on both sides of the vanity, and a ceiling light at the very least. Look into recessed lighting for the ultimate space-saving brightener. Use Mirrors. The beauty of mirrors is that they can bounce light throughout the room, enhancing its beauty and sense of space. Instead of a small mirror above the vanity, try extending the mirror all the way to the ceiling. Instead of just one mirror, look for ways to incorporate other mirrors into the space. Use Glass. Shower curtains are standard fare in modern bathrooms, but glass enclosures may be a smarter choice. Because the enclosure is see-through, it offers an uninterrupted view throughout the bathroom, making it feel larger instead of smaller with the shower sectioned off. Consolidate Where You Can. One of the fastest and most effective ways to make a room feel larger is by minimizing what’s inside it. Rather than both a shower and a tub, could you get by with just a shower, for example? Consolidate where you can to open up more space. Create Better Bathroom Storage. Think strategically about where you store items in your bathroom. Could you use space above the doorway? Is there unused vertical space where storage would make sense? Consider open shelving, or cabinetry with open storage that allows you to showcase attractive items such as hand towels or pretty toiletries. Declutter, Top to Bottom. It should almost go without saying, but clutter is your nemesis when it comes to making rooms feel larger. Get rid of all but your most essential knick-knacks, toiletries and other bathroom products — or, at the very least, get them out of sight. 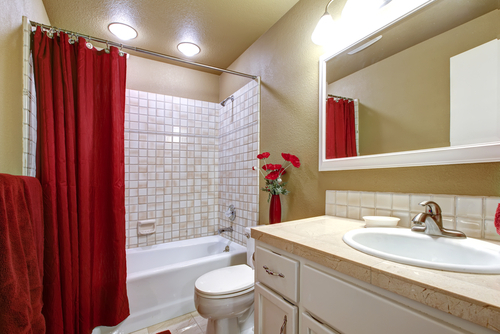 The more open space a bathroom has, the larger it will feel. 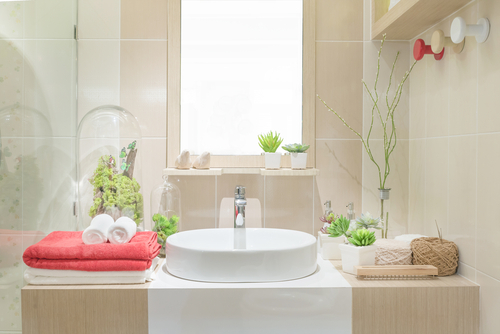 When you want to make the most of the space in a bathroom, use these 10 tips. By painting with neutral colors, consolidating where you can, decluttering and thinking strategically, you can expand the sense of comfort and spaciousness in your room. At Modern Bathroom, we can save you up to 70 percent off pricing with our factory-direct discounts. We offer free shipping on all orders to the 48 contiguous states, and ask about our low-price guarantee. You also can find design ideas on this website. Contact us today to learn what we can do to help with your bathroom remodel.